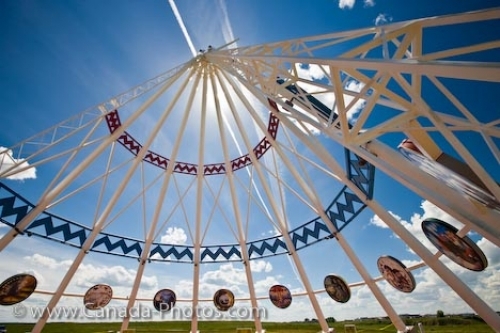 In the city of Medicine Hat, is the world's largest teepee, the Saamis Teepee. Saamis Teepee is the world's largest teepee. This teepee sit in Medicine Hat. The tall white poles has a red and blue zig zag border added. Emblems of Native American culture are attached between each pole of the teepee. An interesting view of Saamis Teepee, the world's largest teepee sits in the city of Medicine Hat.